Picked up a ‘74 K5 a couple years back. Has 350 motor and 350 trans. Has never been started since I bought it. PO didn’t know much about the history of the vehicle either. Most of the vacuum and fuel lines lines to and from the carb ar missing. Can you guys recommend a good link or good pictures to a “dumbed down version” of how the hoses and lines are routed (assume stock set up). I haven’t picked up a chitons manual yet and all the diagrams that I found on the web were tough to follow. Appreciate any and and all help!!! The fuel line is pretty straight forward as it simply runs from the mechanical fuel pump on the side of the block up to the carb. About the only other lines that are important are the distributor vacuum advance (if equipped with a vac advance distributor), the transmission vacuum modulator (if equipped with automatic transmission), and the brake booster (if equipped with power brakes). The distributor connects to the smaller port on the front driver side corner of the carb just above the idle mixture screw, on my truck the transmission vacuum modulator connects to a port on a fitting that threads into the intake manifold behind the carb, and the brake booster connects to the large vacuum fitting off the back of the carb. I'll see if I can get a clear picture of the top end of my '74, but it's in the barn and there are no lights where it is stored. *EDIT* - Here's a picture of my K5. My distributor is currently routed to a manifold vacuum source rather than the stock, ported source. Ported vacuum sources show no vacuum at idle (throttle closed), but will show vacuum with the throttle slightly open to wide open throttle. You can google the benefits of one over the other. 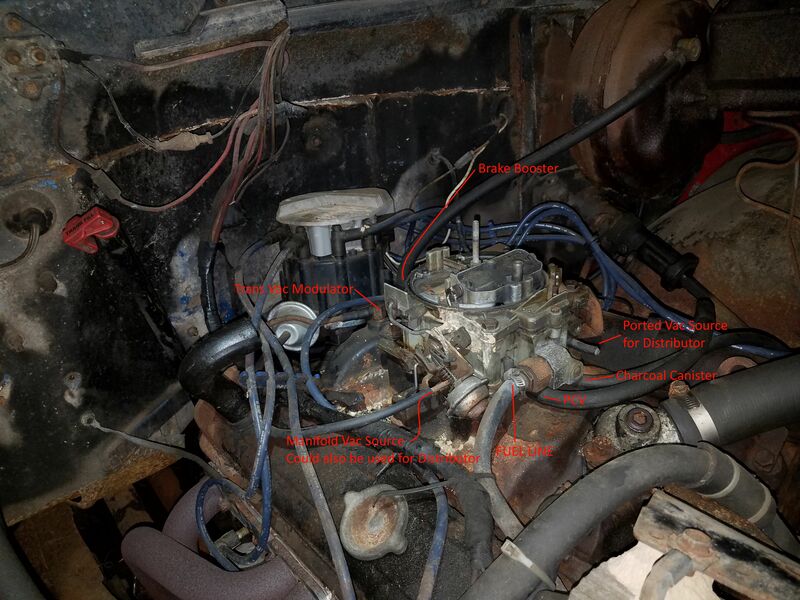 Quick Reply: ‘74 K5 Vacuum & fuel line routing?